Despite having won the Volvo Ocean Race with a leg to spare, Ian Walker and all his crew slipped into Gothenburg to take fifth place on the final leg with mile-wide grins on their faces. On his third attempt Ian Walker has become the first British skipper to win the Volvo Ocean Race since the race was created by the British Royal Naval Sailing Association in the early 1970s. He said the reaction back in Abu Dhabi had been overwhelming, with huge media and public interest. On a personal level, he was still waiting for the scale of his achievement to sink in. “It’s only when I get to share this with friends and family that I’ll really process it,” he said. 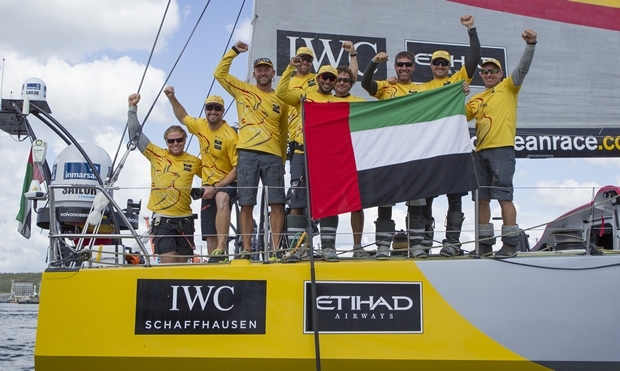 The Abu Dhabi Tourism & Culture Authority-backed team was assured of victory irrespective the Leg 9 result and will be crowned Volvo Ocean Race 2014-15 champions on Saturday at the Life At The Extreme Awards. “This is my second Abu Dhabi campaign and I am grateful for our backers at Abu Dhabi Tourism & Culture Authority for their unwavering support," Walker continued. ADOR had to play catch-up for much of the first section of Leg 9 from Lorient to a pit stop at The Hague in The Netherlands after being slowed by large clumps of seaweed along the Brittany coast. The Abu Dhabi yacht made it into The Hague in fifth place after a southerly route around a 140-mile exclusion zone failed to pay off. The fleet departed from The Hague for the 460-mile second section of Leg 9 in the order they arrived, with Walker’s men setting off three hours, 53 minutes and the Azzam crew pushed the Abu Dhabi yacht hard in flat water and strong winds on the way to the northern tip of Denmark by the time they passed the Danish town of Skagen – the most northerly headland in the entire race – had closed to within visual range of the top four. Two of the ADOR line-up are now double VOR winners: Ireland’s Justin Slattery, who has sailed with Ian Walker on his last three campaigns, first tasted victory as part of the ABN AMRO One crew in 2005-06; while Australian Phil Harmer has won back-to-back races after sailing with the French Groupama sailing team in the 2011-12 race. Harmer added: “I’m delighted to have done the double. The VOR remains the greatest challenge in fully crewed offshore racing, so to win it twice is very special." As well as securing the overall title, ADOR also leads the separate short course In-Port Race Series with an advantage of six points over its nearest rival, with just next Saturday’s final Gothenburg test to go. ADOR skipper Walker said he believed achieving a double victory was a realistic prospect. “Nothing is guaranteed in the In-Port Races,” Walker cautioned, "but we would dearly love to bring both trophies back to Abu Dhabi after the race.